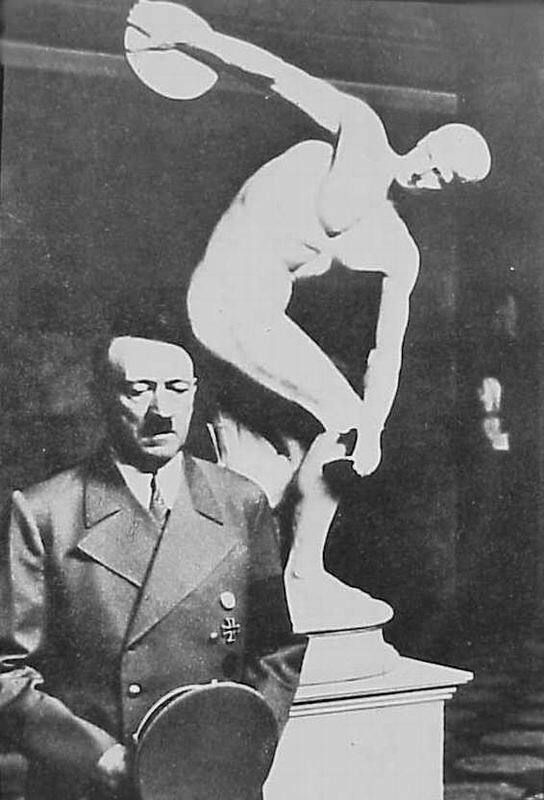 A rather bashful Adolf Hitler posing next to the Discobolus Palombara in the Munich Glyptothek. In 1937 Adolf Hitler negotiated to buy it, and eventually succeeded in 1938, when Galeazzo Ciano, Minister of Foreign Affairs, sold it to him for five million lire, over the protests of Giuseppe Bottai, Minister of Education, and the scholarly community. It was shipped by rail to Munich and displayed in the Glyptothek; it was returned in 1948. It is now in the National Museum of Rome, displayed at the Baths of Diocletian. 1 Ιανουαρίου 2011 - 8:12 μ.μ. I am actually amazed and shocked that Germany would ever prohibit anyone from seeing anything on Youtube. I have never ever heard any such instance, except, as you mentioned, in countries like China. I can actually find no reason why this should happen. 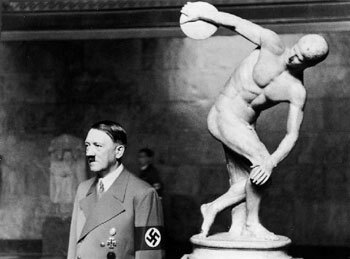 This is a funny video, playing with the still photo I show above, showing the Discobolus hitting Hitler on the head with the discus. Worse things have been shown, why would they be annoyed with this funny instace, I fail to understand. And who are "they" by the way? Who decides on behalf of the Germans what they are allowed to see on Youtube? 16 Νοεμβρίου 2011 - 1:30 π.μ. 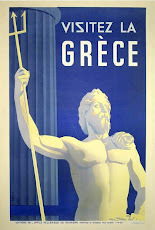 Consuming Greek Antiquity is an on-going project of mine aiming to explore the various ways through which Greek antiquity has been consumed by the 20th c. popular media, especially photography and graphic illustration. I'm mainly interested in the most original and ingenious examples of incorporating and often interpreting elements of the ancient greek culture. Whole sites, monuments, artefacts, historical and mythological figures appear in the least expected places and these unexpected occurences and strange encounters are the main focus of this blog. Having just written this, I need to stress that this is a more-fun-than-work project, rather than the other way round, so no strict criteria are applied, i.e. not only 20th c. and not only popular media, but I'll try to stick to only Greek antiquity. Effort has been made to include attribution to the original sources of the works presented here, but apologies are offered in advance where I have failed. Θέμα Υδατογράφημα. Εικόνες θέματος από Colonel. Από το Blogger.